The 5002 is unique. All other scales require manual zeroing for each weighing by pushing a button or turning a knob. Only Scale-Tronix scales automatically return to zero. You may even turn the 5002 on after the patient is on it and get a correct weight. A paper-tape printer automatically prints out patient weight providing a permanent, accurate record. The 5002 weighs patients without zeroing in between. 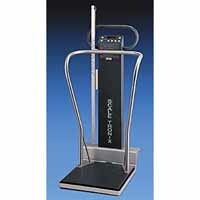 Itâ€™s the only stand-on scale that automatically returns to zero allowing you to weigh a continuous stream of patients. A â€œRecallâ€� feature retains the last weight reading after the patient has left the scaleâ€”until the next patient is weighed. If the patient gets off the scale and you forget the weight, simply press the â€œRecallâ€� button. The previous weight is displayed and a â€œPrior Weightâ€� message blinks. In addition, the press of a button allows reweighing while the patient is still on the scale. An audible signal indicates when a patientâ€™s weight is stored in memory. Our new ergometric design is perfectly balanced to roll effortlessly. The low-profile platform remains motionless while weighingâ€”provides accurate weight on any floor surface, even carpeting. The handrail is ideal for unsteady patients. Patients may hold the handrail without effecting weight readings. Power cords have been eliminated. Battery life is typically one year, or approximately 20,000 weighings. Weighing Range - 880 lb-400 kg. Automatic Zero - Automatically returns to zero, ready for next patient. Reweigh - Recomputes patientâ€™s weight while patient is on scale. Platform - Low profile 18" X 19 1/2" X 1 1/2", with heavy-duty rubber wheels. Audible Signal - Indicates weight reading is entered into memory. Successive Weighing - Allows weighing a continuous stream of patients without zeroing in between. Wrap-Around Handrail - Heavy-duty, stainless steel. Printer - (Accessory) built-in, paper tape, uses standard thermal paper.